Auchincruive, 4 miles northeast of Ayr, is part of the ancient seat of the Cathcart's. The present day house (the Robert Adam designed mansion, Oswald Hall) dates from the 1700s. The estate holds a number of lodges, a tea house and a clock tower. Richard Oswald (a merchant from London, and a commissioner in Paris for peace negotiations with the Americans) bought the estate in 1764. More recently, Auchincruive was gifted to the Secretary of State by John Hannah of Girvan Mains. 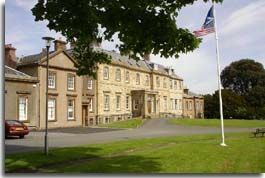 It became the home of the Scottish Agricultural College with the Hannah Research Institute being named in his honour. The estate was also available for use as a venue for outdoor events such as the Ayr Agricultural Show. Oswald Hall could then also be booked for conferences or musical events. In December 2012, Oswald Hall was sold for £1 million to biotech company Neogen Europe for use of its offices. The Managing Director of this company, Dr Stephen Holmes, was a former scientist at the Auchincruive College. The grounds around the house and along River Ayr can be used by the public for scenic walks.